Ananthapura Temple is dedicated to Lord Vishnu. It is the moolasthanam (original abode) of Ananthapadmanabha, the deity of Sree Padmanabhaswamy Temple in Thiruvananthapuram. 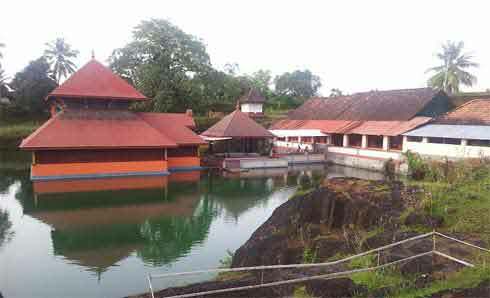 The temple is located at Kumble in Kasargod in Kerala. The shrine is around 5 km from Kumbla on Kasargod – Mangalore National Highway 66. The murtis worshipped in the temple are not made of metal nor stone, but of a combination of about 108 materials collected from various parts of India and combined to form the murtis through a process known as Kadusharkara yogam. In the main sanctum sanctorum, Ananthapadmanabha, the form of Maha Vishnu worshipped here, is depicted as seated on the divine serpent Anantha. The main murti is flanged on both sides by Bhudevi, the Goddess of earth, and Sridevi, the Goddess of prosperity. Garuda and Hanuman is depicted as praying with folded hands. Jaya and Vijaya, Lord Vishnu’s attendants, stand in guard at the entrance. The subsidiary deities worshipped in the temple are Goshala Krishna, Mahishasuramardhini, Ullakulu, Maha Ganapati. The main sanctum sanctorum is surrounded by a rectangular lake. The gopuram and the sanctum sanctorum are surrounded by a bridge. The outer walls of the sanctum sanctorum have beautiful mural paintings. A huge cave on the lake is believed to be the entrance to a tunnel to the Sree Padmanabhaswamy Temple in Thiruvananthapuram.